Crown your beloved Balsam Hill Christmas tree with these beautiful tree toppers. Give your tree the perfect finishing touch with one of our premium Christmas tree toppers. 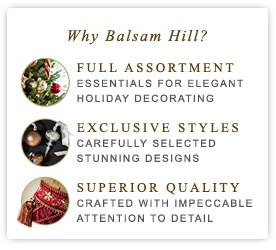 Balsam Hill presents a selection of stars, angels, animated creations, and other unique designs. Whether you prefer a white tree with coloured lights or a mighty fir with clear lights, we have something in our collection that will tie your whole tree together. Our products are high quality, many of which have been handcrafted with holiday cheer in mind. Our toppers come in various sizes and colours. For trees up to 210 cm the small size topper is ideal, and for trees taller than 210 cm we offer a large size as well. A customer favorite is the Capiz Star Tree Topper. This topper is handcrafted with capiz shells and pre-lit with incandescent lights. This star is what is missing from your tree. To make sure it stays put it comes with clear zip ties attached to ensure it will stay securely fastened to the top of your tree. If you are not looking for a star we have many other items to choose from. Try putting an angel at the top of your tree for a classic, elegant look. If you want to decorate to a winter wonderland theme a snowflake would be the perfect choice. No matter how you decorate the top of your tree it will be the first thing people look at. We hope that our tree toppers will become part of your cherished holiday traditions for years to come. Our ornaments page has many options for pieces to match your new topper. Remember to make sure when you are purchasing a tree that you allow room at top for one of our beautiful tree toppers. We recommend leaving 15 cm between the tree and your ceiling. You can reference our Balsam Hill tree buying guide for more information.